I have been toying with the idea of cooking my way through the entire Edmond’s Cookery Book for some time now. The seed of this idea began to germinate a while back, after I watched Julie and Julia and my mind leapt to some more Antipodean possibilities. Although this idea has flitted through the corners of my mind (or more towards the centre during hungrier moments) it was not until I started this blog that I finally had a reason to cook my way through about one thousand recipes which include such gems as cinnamon cream oysters, brandy balls and fruit betty. I shall pursue this challenge in between blogging about other bits and pieces I have whipped up in the kitchen because I fear Edmonds, week in week out, for the next three years, might not provide enough variety. So, some posts will be Edmonds posts, and some will be posts about whatever has taken my fancy that day. I’m attacking this one alphabetically, and so sadly we will all have to wait to find out what on earth fruit betty is and how one attempts to cook it. 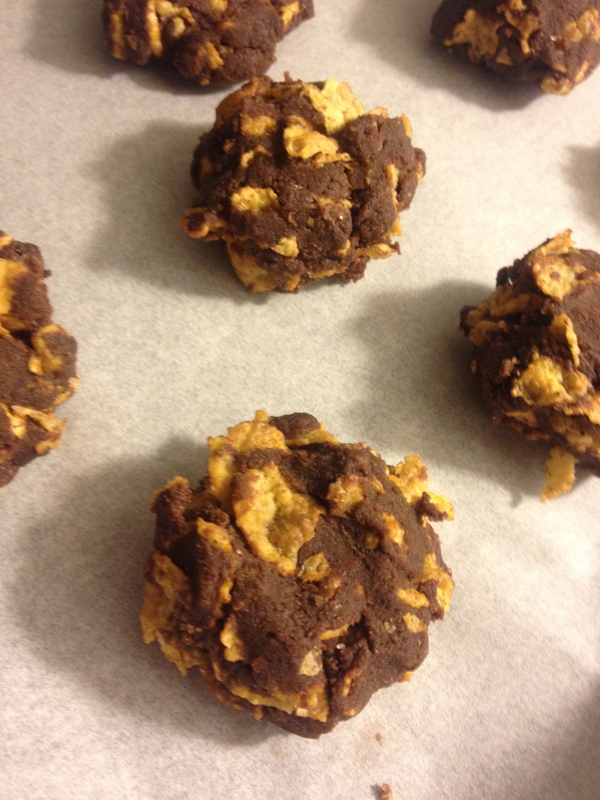 Not to fear, the first recipe in the Edmond’s index is still a crowd-pleaser…the ever popular Afghan biscuit. 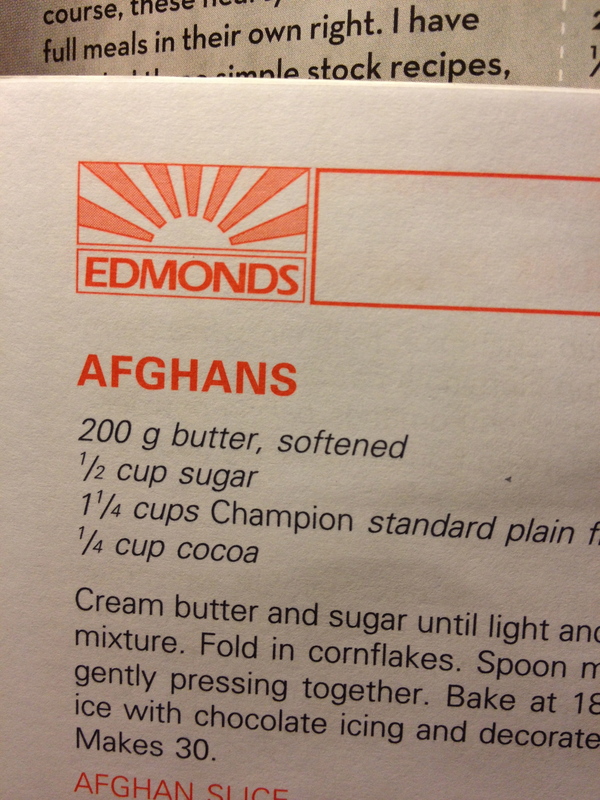 Wikipedia offers no answers on why Afghan biscuits are so named, and frankly, given that Edmonds Cookery Book was first published in 1908, I suggest we do not probe too much further on this one. 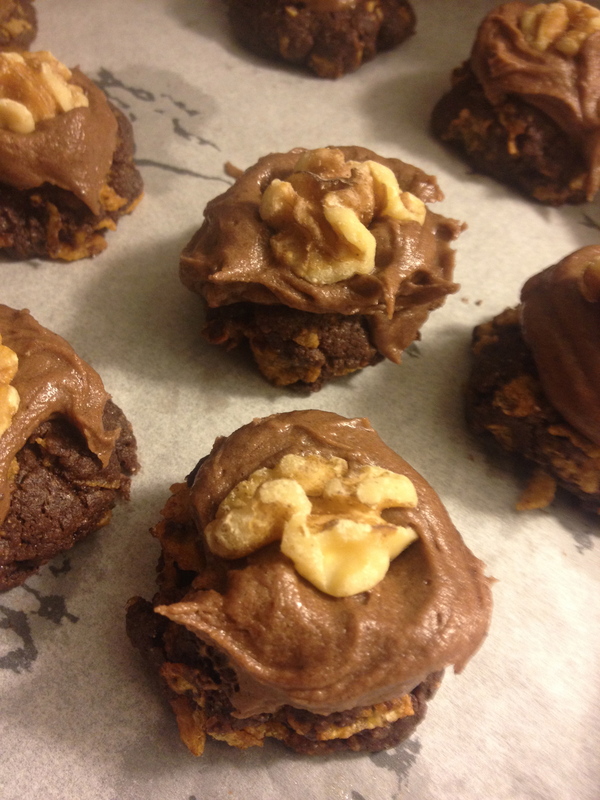 Suffice to say, they are a crumbly mouthful of chocolatey goodness and I am pleased to have an excuse to bake some. Begin by creaming the butter and sugar until it is light and fluffy (is it just me or is creamed butter and sugar the best thing ever? I could eat a bucket of that stuff). 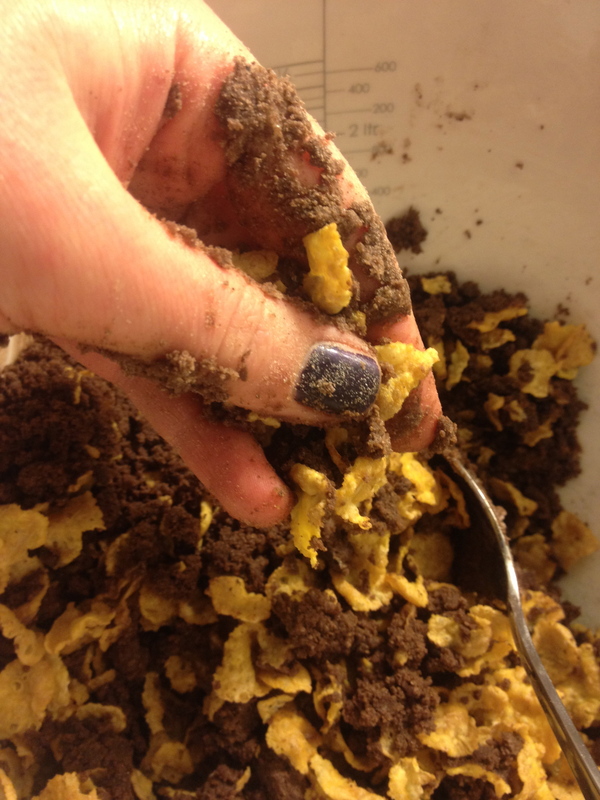 Sift the flour and cocoa and stir it into the creamed mixture and fold in the cornflakes. At this stage, I feared that my mixture was looking kind of dry and lumpy, so I used my hands (clean of course) to blend it together a bit more, and this worked quite well. Spoon mounds of mixture onto a greased tray, gently pressing together. There is no reference here to what sized spoon-mound we are talking about. So, I used one of the soup spoons from the drawer as this was closest to hand, and this seemed to work. I have to say they don’t look super-attractive in their uncooked, uniced form. Bake at 180 degrees celsius until set. 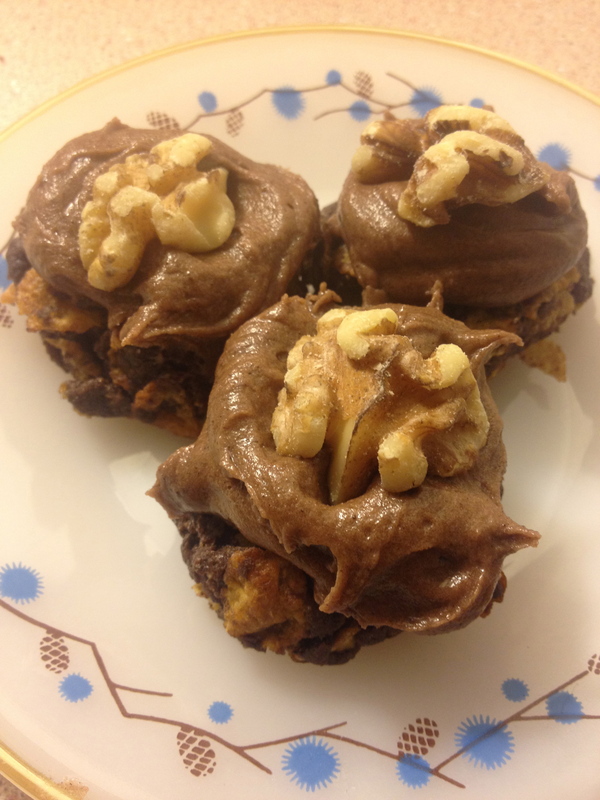 When cold, ice with chocolate icing and decorate with a walnut ‘if wished.’ Hell yeah I wish! It just wouldn’t be an Afghan biscuit without a walnut. Nice work! Was that the first time you made afghan biscuits?